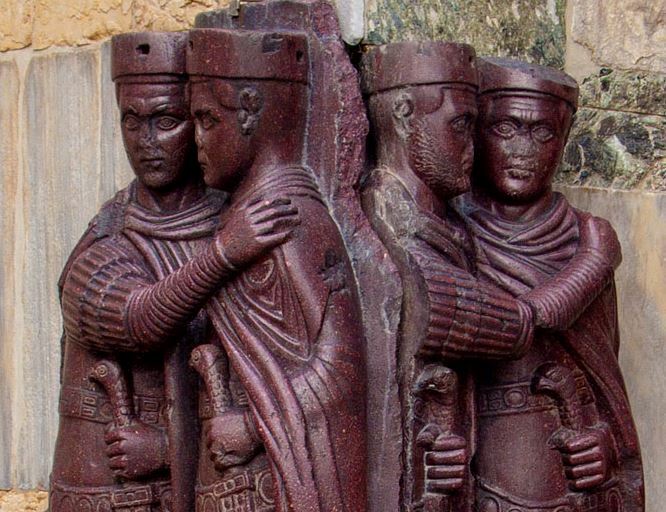 'Tetrarchy' means the government of four people, and was a system introduced in 293 AD by Roman Emperor Diocletian. Under the Tetrachy, the sovereignty of the Roman Empire was divided amongst four people; two Augusti or 'Senior Emperors' and two Caesars or 'Junior Emperors'. The four emperors based themselves not in Rome, but in cities closer to the frontier, from which they could each oversee and protect a part of the Empire. Unfortunately, the system was too naive - when Diocletians & Maximian's reigns were up they abdicated, but the next set of Augusti were less concerned with upholding the system and soon the Tetrarchs were at each other's throats. By 313 AD, most of the Tetrarchs and claimants were dead, and by 324 the empire was once again united under Constantine the Great.